The decision to remove public housing from Millers Point, The Rocks and Dawes Point has sent shockwaves through these local communities and through the inner city public housing communities we service. Not only does the decision cleanse these suburbs of all public housing it also changes the suburbs themselves which were listed in the state heritage register for their community as well as for their buildings. Saved from redevelopment by the Green Bans the area is now under threat by an under-funded public housing system selling off, on a ten year average, 2.5 public housing properties a day to cover its operating costs (see Summer ISV’s Director General: Public Housing Challenges). This has been done under the guise of ending non-existent subsidies to public tenants, many living in properties obtained at no cost from the Maritime Services Board. In the case of the Sirius building it applies to a modern high-rise building fit for purpose with no other problem than its location. ISRCSD moved quickly to provide assistance to the Millers Point community and while ongoing funding is being found we are seeking donations to support this work – you will find details on how to support this project at Millers Point Public Housing Support Project on the ISRCSD website. 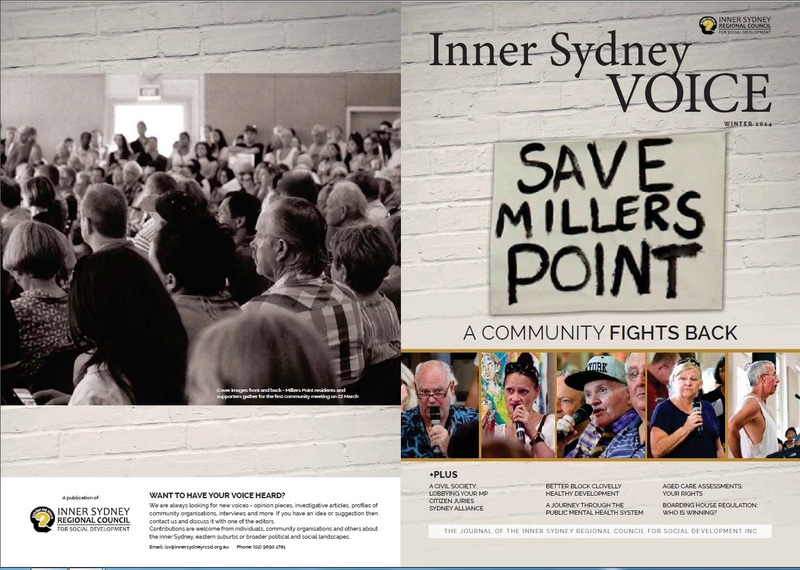 You can find out more about some of the issues raised by the announcement in Millers Point & The Rocks – Some places are too upmarket for public housing and Millers Point & The Rocks – A Community fights back. In Save the Rocks March 1978, One from the Vault goes back to a report on “Save the Rocks” from our first issue in 1978. Our article on Understanding Aged Care Assessments also has relevance to Millers Point given that many of those impacted by the decision are aged and there is a concern that ACAT assessments might be used to try and push some people into care rather than replacement public housing with easy access to services. A focus for this issue is on community involvement in civil society. Alex Greenwich shares his experience from both sides of the desk in How to Lobby your MPs. In Sydney Alliance: Building Civil Society Differently we explore how the Alliance works, while Iain Walker from newDemocracy explores how a citizen’s jury should work In the Jury we Trust. On the planning side in Better Block (page 18) we explore community driven planning and how locals reimagined Clovelly Road and what can be learnt from it. While Susan Thompson explores Creating healthy built environments and gives us some guidelines in Assessing New Development to see how it supports Health and Wellbeing. From the Looking Forward Looking Back conference we have Mahlie’s powerful A Journey through the Public Health System which highlights where the system needs to improve. Boarding Houses play an important role in the affordable housing and homelessness narrative. In Boarding House Regulation – Who is winning? we look at some of the issues.